In this age of online media, traditional media strategies no longer have to be your own option when you are looking to promote your brand and attract your target audience. New tools and platforms make it easy and affordable to simply distribute your own media without building relationships with reporters or others in the media. Yet, many companies may not yet realize just how easy and effective it is to so. 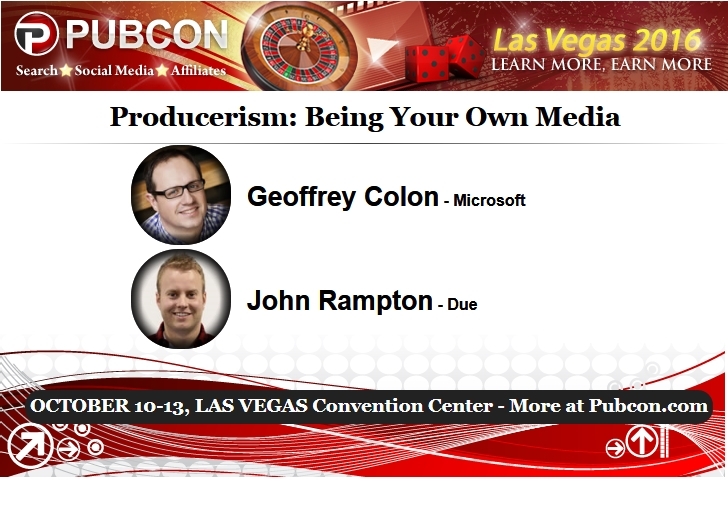 During the session, Geoffrey Colon leveraged his experience as a disruptive marketer to talk about various ways you can create your own media. His examples included how to produce video from your mobile phone as well as how to use paid social media and search to distribute your media and create demand for your audience. Examples also included producing and distributing a podcast and promoting it by using apps, such as Clammr. Geoffrey also provided specifics on how to livestream video to such apps as Streamup, Spreecast, Periscope and Facebook. He noted that it was so easy that anyone could make their media look better than Hollywood could do just using available iOS or Android apps to create weekly live broadcasts. John discussed his own extensive background in generating his own media, acknowledging that he has never bothered to use press releases, pitch letters, or any reporter cold calling to get his press for his own brand and for his company, Due. Instead, he has focused on emerging media as a great communications tool that can get the media attention you want, quickly and cost-effectively. John has successfully leveraged his own blog and its growth to get the attention of top-tier publications that have asked him to write for them, such as Mashable, TechCrunch, Entrepreneur, Inc. and many others. John has also leveraged the ability to partner with others on content to generate articles that are then syndicated and include links to his own websites along with many others. In this way, he has used thought leadership strategies, linking, and content syndication to get media attention. These media placements are then turned into clips that are shared with his audience via his personal and company blogs as well as across all the social media platforms he uses. You can easily take advantage of these effective and affordable ways to produce your own media and start getting more attention from your target audience.